Add cumin seeds, green chillies, peppercorns and cashewnuts to the batter. Heat a tawa, when it is hot enough pour two ladlefuls of batter in a circular manner. Drizzle oil along the edges and also in the holes of the dosa. (the tawa should be very hot while u are pouring the batter). When the bottom turns crisp and golden in color , remove from the tawa . Serve hot with Coconut Chutney/Sambar and enjoy. Pour the batter in the hot tawa,add some finely chopped onions on to it. Drizzle 1 tsp. of oil and 1 tsp. of ghee . (If you are not diet conscious ,skip the oil and enjoy this dosa with ghee). Always stir the batter, before you pour it over the tawa. If the dosa is very thin , no need to cook the other side. you can also add chopped curry leaves and coriander leaves. Before adding the onions and green chillies, you can also saute it and then add to the batter. 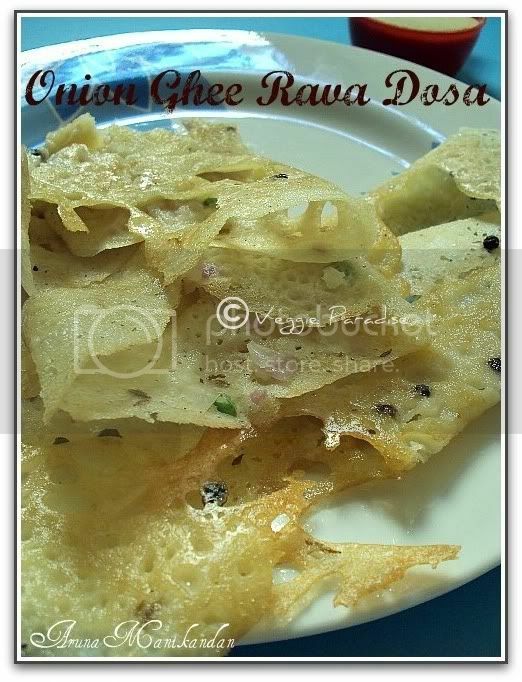 I ve nt tried rava dosa yet.....bookmarked!!!! perfect lacy dosas! Looks wonderful! Rava Dosa always eludes me Aruna.. but I should try this soon ! Super yummy & tempting dosa. Rava dosas are always welcome in my family..yours looks super good. Crispy and perfect rava dosas! Mouthwatering!! They look yummy and they are instant...works out great ! Instant & tasty!!! They have come out so nice & yummy..
Looks yummy and delicious. Love them anytime. 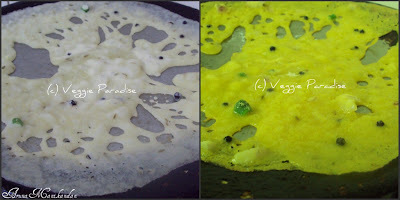 wow easy rava dosa.....love it! Looks so perfect,crispy and delicious dosa.. 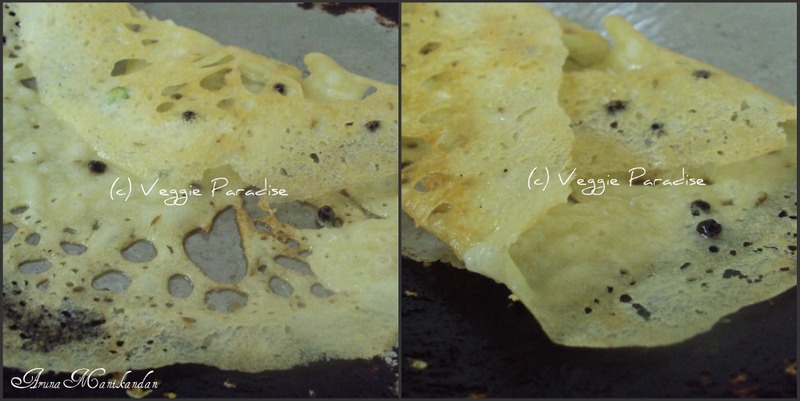 I just love the crispy crunchy rava dosa and yours looks perfect! lovely and perfect rava dosas. Rava dosa looks fabulous and prefect..yumm! 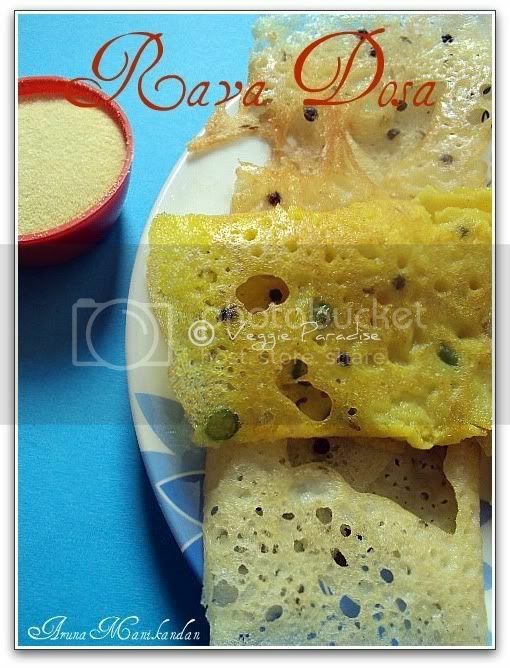 rava dosas look crispy and delicious.. fabulous recipe..
looks extremely well made and delicious! Its come out so perfect...Yum! Dosa looks crisp n tempting! They look crispy & yummy..
Looks perfect. My fav breakfast. my son's fav, very crispy.